Varying scales of dance, music, performance, workshop and intervention contribute to the DOT Art event programming roster each year. Event programming encourages the use of sustainable forms of transportation including walking, cycling, bus and subway while reducing traffic congestion, air pollution and greenhouse gas emissions. Family-friendly, unique and interactive programming showcases the rich and varied resources of NYC. Summer Streets is an annual celebration of New York City’s most valuable public spaces, its streets. In 2017, nearly 300,000 people participated in the event. Summer Streets provides space for healthy recreation and encourages New Yorkers to use more sustainable forms of transportation. 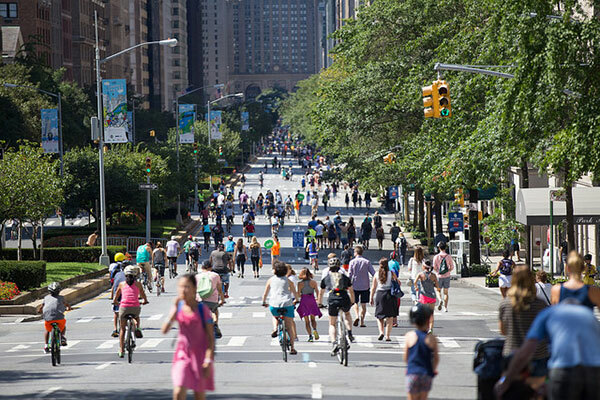 On three consecutive Saturdays in August, from 7:00 AM to 1:00 PM, seven miles of New York City’s streets are opened for people to play, run, walk and bike. The event route extends along Park Avenue and its connecting streets from Central Park to the Brooklyn Bridge. Programming is presented at five rest stops: Uptown (51st Street and Park Avenue), Midtown (25th Street and Park Avenue), Astor Place (Astor Place and Lafayette Street), Soho (Spring Street and Lafayette Street), and Foley Square (Duane Street and Centre Street). Visit the Summer Streets website www.nyc.gov/summerstreets for event information. All inquiries regarding Summer Streets may be submitted to: summerstreets@dot.nyc.gov. Car Free Earth Day is an annual car-free event held on the Saturday closest to Earth Day, which is April 22nd. The event opens thirty blocks of Broadway from Times Square to Union Square for people to explore on foot during event hours. Programming is presented at five rest stops: Times Square (42nd Street and Broadway), Herald Square (34th Street and Broadway), Garment (39th Street and Broadway), Flatiron (23rd Street and Broadway), and Union Square (17th Street and Broadway). Environmental programming is offered by City agencies and nonprofit organizations along the route to promote activism and education surrounding climate change, sustainability and other relevant topics. Visit the Car Free Earth Day website www.nyc.gov/carfreenyc for event information. All inquiries regarding Car Free Earth Day may be submitted to: carfreenyc@dot.nyc.gov. Corporate entities are invited to submit ideas for event sponsorship at varying levels and may host programming that relates to their brand along the route. All inquiries regarding event sponsorship may be submitted to: sponsorship@dot.nyc.gov. All programming is free of charge and designed for people of all ages and ability levels. Nonprofit organizations and visual and performance artists, regardless of residence, are eligible to apply to participate in the event. Event programming proposals must be submitted for review by the DOT Art + Event Programming Advisory Committee and Event Committee by the application deadline. Application deadlines are announced up to 4 months in advance of the event date. Detailed information is listed below based on programming typology. Public Art – Professional artists are invited to submit proposals to produce interactive public art installations along the designated event route. Proposals should engage event participants mentally and potentially physically, reimagine the route, act as a destination and must be easily installed and removed within event hours. Engineering review by a NYS licensed engineer for all sculpture work is required. Selected public art proposals shall receive up to $20,000 to cover all expenses to design, fabricate, present the artwork including, but not limited to, costs associated with the following: labor, materials, fabrication, installation, equipment rental and transportation. Performance – Musicians, dancers, comedians, actors and poets are invited to submit proposals to perform on 12’ x 16’ stage platforms or other designated locations along the event route. Proposals should demonstrate experience performing within the public realm and/or in front of large audiences. A PA system, sound tech and 12’ x 16’ stage (if applicable) are provided to all performers at no cost. Performers are eligible to receive funding dependent on the duration and number of performances provided. At a minimum, performances at least 30 minutes in length shall receive between $200-500. Activities – Nonprofit organizations are invited to submit proposals to host activities, demonstrations, workshops, classes, historical tours, etc. A strong Activities proposal engages people of all age and abilities in a fun and dynamic way that relates to the event mission. Eligible nonprofits must have experience planning and leading public programs, share the values and missions of the event and provide services and staff for the full length of event hours. Tents, tables, chairs, linens and support from Event staff is provided to partners at no cost. Selected nonprofit partners are eligible to receive funding dependent on the complexity of the proposed activities and the number of committed event dates.